We’d love your help. Let us know what’s wrong with this preview of The Second Coming Of The Church by George Barna. In this "blueprint for survival," Christian sociologist George Barna evaluates the moral and spiritual decline of society and the corresponding stagnation within the Church. 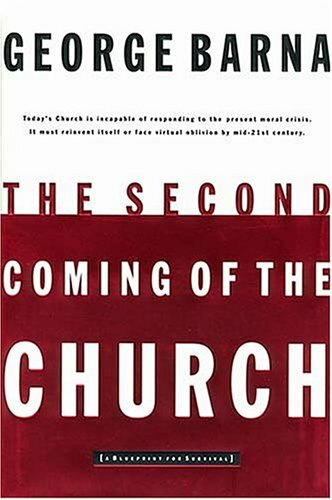 Using hard data, Barna unveils the status quo and argues convincingly that the Church must re-invent itself or face virtual oblivion by the mid-21st century. To ask other readers questions about The Second Coming Of The Church, please sign up. It is an urgent plea for people of God to stop dabbling in religion and to grow in spiritual maturity. In fact, we have discovered that the younger the adult, the less interested they are in a smooth presentation. Excellence and professionalism are "performance strategies" that appeal to the late Builders and early Boomers. Among the Busters, however, the keys are relevance, genuineness and authenticity. They are more interested in experiencing a sincere and honest presentation that raises meaningful questions than a polished speech that provides all the answers. Preachers who address the audience without constant reference to notes, and those who do not "hide" behind a pulpit, also seem to generate a more positive response from their listeners. The future of the Church in America depends largely upon the spiritual commitment of families. The first half to two-thirds of this book really gripped me as Barna talked about research done that shows that the Church in America is highly ineffective and there is very little difference between Xns and non-Xns in matters of behavior. His argument for a Biblical worldview is compelling and hard to argue against. Another book by George Barna. Definitely good. I picked this up to review the symptoms afflicting the church, and perhaps to learn of the cure suggested. This is pleasant reading, tho not addictive. I got what I wanted. Bye, bye. George Barna was raised and educated on the East Coast before moving to California in the early 1980s. He held executive positions in advertising, public policy, political campaigns, and media/marketing research before beginning his own company, the Barna Research Group (now The Barna Group), in 1984. The firm analyzes American culture and creates resources and experiences designed to facilitate m George Barna was raised and educated on the East Coast before moving to California in the early 1980s. He held executive positions in advertising, public policy, political campaigns, and media/marketing research before beginning his own company, the Barna Research Group (now The Barna Group), in 1984. The firm analyzes American culture and creates resources and experiences designed to facilitate moral and spiritual transformation. Located in Ventura, California, The Barna Group provides primary research as well as developmental resources and analytic diagnostics. The company has served several hundred parachurch ministries and thousands of Christian churches throughout the country. It has also supplied research to for-profit corporations such as Ford Motor Company, The Walt Disney Company, Visa USA, and Prudential, and has assisted the U.S. Navy and U.S. Army as well. To date, George Barna has written more than 40 books, predominantly in the areas of leadership, trends, spiritual development, and church health. Included among them are bestsellers such as Revolution, Transforming Children into Spiritual Champions, The Frog in the Kettle, The Power of Vision, and Pagan Christianity? Several of his books have received national awards. He has also written for numerous periodicals and has published various syndicated reports on topics related to faith and lifestyle. He also writes a bimonthly research report, The Barna Update, which is accessed by hundreds of thousands of people through his firm's Web site (www.barna.org). His work is frequently cited as an authoritative source by the media. He has been hailed as "the most quoted person in the Christian church today" and is counted among its most influential leaders. In 2009, George initiated Metaformation, a new organization designed to help people maximize their potential. More information about his current projects is available from www.georgebarna.com.